I owned a 2006 Lotus Exige in this exact color – now called Exige Orange. It was amazing. The handling was near perfect and the lightweight chassis meant I could overcome a few of Newtons’ laws when I got into trouble. I’ve always wanted to replace it and now wish I was still a banker and had the means to buy this Club Racer edition. It looks awesome. The Exige is now a 3.5-litre supercharged V6 engine which means its only 4.0 seconds to reach 62mph. And while my little naturally aspirated exile would fade above 110mph this this club racer version does 170 mph. Nothing like corporate marketing. I’m not even sure what he said to be honest. But I bet the Exige S Club Racer rocks! Available only as a coupe model(although so was my 2006, but I was able to unbolt the roof anyway), the car generates 42 kg of aerodynamic downforce at 100 mph, thanks to the front splitter, rear wing and flat underside. The club racer weights 1161 kg, which is 15 kg lighter than the standard Exige S. The interesting part is where they saved the weight. Things like a special lightweight battery, lightweight centre console, lighter doors and lightweight sports seats. And of course the car comes with three traction slip thresholds (‘Drive‘, ‘Sport’ and ‘Race’ settings) allowing the driver enhanced vehicle control before intervention is required. And when you select ‘Sport’ and ‘Race’ settings the car increase its throttle responsiveness. The Exige S Club Racer is available in Metallic White, Exige Orange, Metallic Yellow and Matt Black (option). And you get fancy Club Racer decals on the dashboard, seats and outside above the side indicator lights to let people know you have the fancy version. All this additional equipment adds £4,500 worth of extra value, for only £2,400 more than the standard Exige S (£54,500). 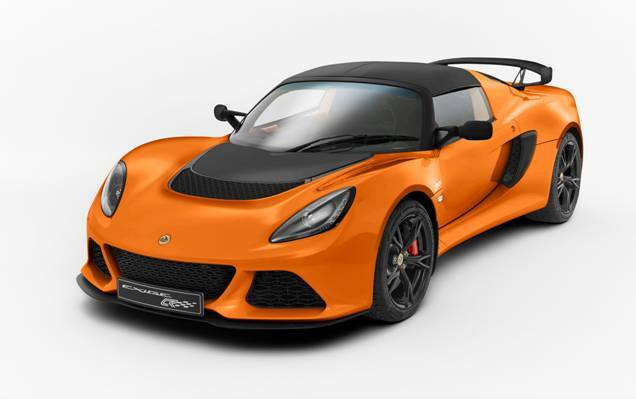 The Lotus Exige S Club Racer is on sale now with an MSRP of £56,900. This price might vary for other countries according to the press release but orders can be placed now. Urban 19.5 mpg – 14.5 litres / 100 km. Extra urban 37.2 mpg – 7.6 litres / 100 km. Combined – 28.0 mpg – 10.1 litres / 100 km. CO2 emissions 235 g CO2 / km. What Car Got You Started?